Outside temperature has been ruthless for some 5 weeks already, and streets and buildings are seriously heated up. The same heated up mood you can observe in Salzburg in general, – most of performances are sold out ages ago, and there are people around Grosses Festspielhouse with sad faces and paper signs “Suche 1 karte” in abundance. My first night in Salzburg this year is marked by first attendance of live performance of “Fidelio”, starring Jonas Kaufmann. 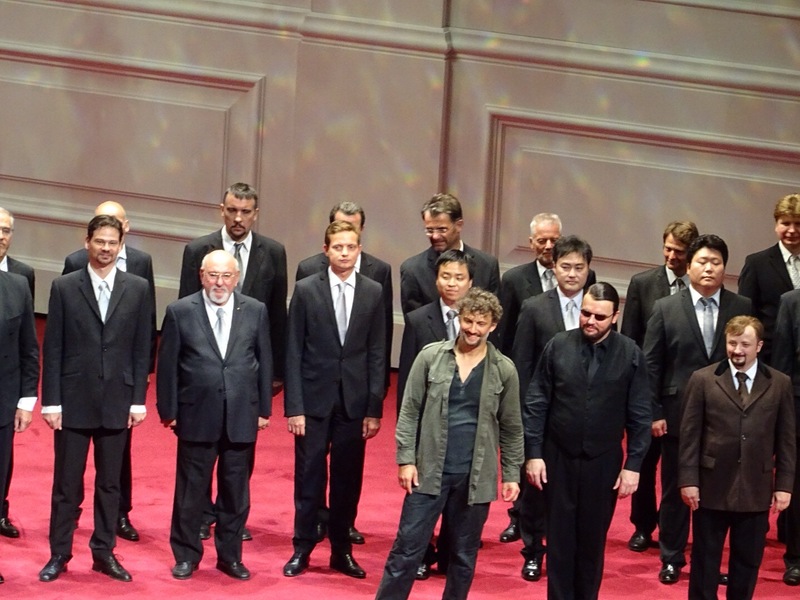 The reviews have been contradictory, mostly regards production, but all reviewers have unanimously praised Jonas as outstanding interpreter of Florestan. I have visited festspiele shop and bought the programme ahead of performance to be able to see what has been intent of Claus Guth, and in the interim have been seduced by DVD of Fidelio by Opera Zurich with Jonas. Striving for eternal freedom and happiness by escaping from self inflicted imprisonment defined by your own mind, at the same time identifying illusions of yourself and others, and knowing that there is no paradise.. Utopian and tragic, utmost desolation, soulsearching.. Would love save humankind? All themes speak loudly from genious music of Beethoven, and this is such a pity that “Fidelio” is his only opera. Stage set for Act 1 positively surprises by clearness of intent and smart use of shadows and light. Concept of shadows, “otherselves” rings the right bell, the problem is with intensity of the concept usage – too much, too didactically. It feels like director believes the audience is slightly retarded. Centerpoint of the stage defined by black rotating parallelogram brings some associations with Kaaba. 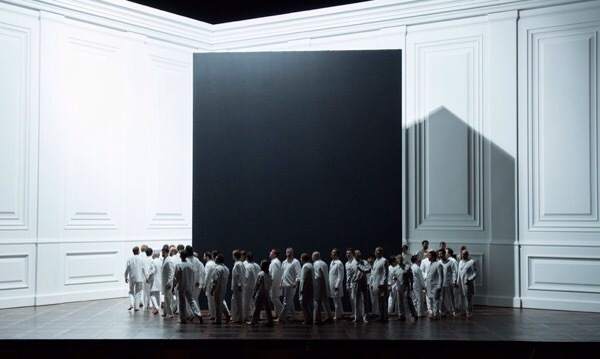 It allows performers to move around without distractions and provides for undisturbed flow of the story, and reminded me the concept of rotating centerstage in recent production of Faust in Deutsche Oper. Started in the first act, the second act has much more overplayed elements – from mimes speaking to us and their other selves in sign language, funny soundscapes with wind, sighs and cosmic themes, and noisy overacting by Jonas (he fell to floor at least five times, it was probably intended to illustrate despair and exhaustion of Florestan) made it problematic to keep deep absorbption and enjoy vocal and orchestral performance at the most. In addition it felt like director has intended to merge Fidelio and Matrix, as Pizzaro and his gang were so badly over the limit and became ridiculous. Jonas Kaufman has portrayed Florestan vocally impeccable, but with challenges on dramatic part. Similarly Adrianne Pieczonka delivered impressive Leonora/ Fidelio, while her acting has been monotone and repeating herself. 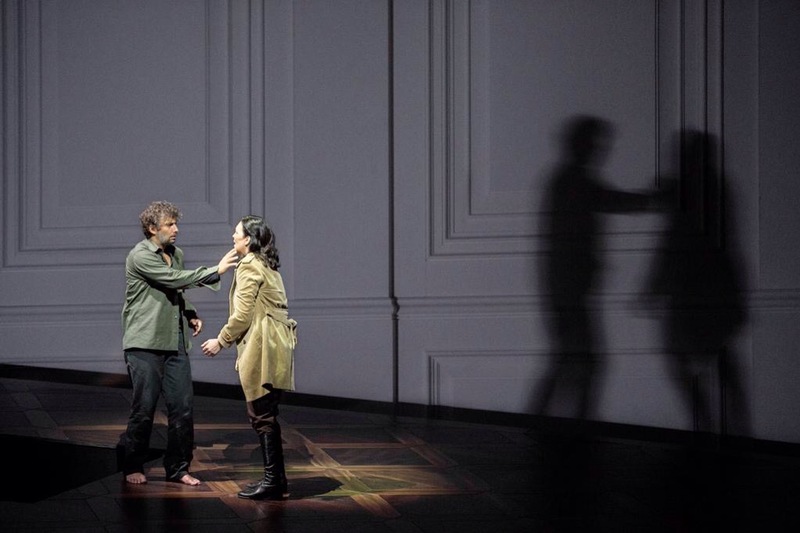 Hans-Peter König as Rocco delivered convincing and emotionally fulfilled character, and Olga Bezsmertna was bit confused but fully believable Marzelline. 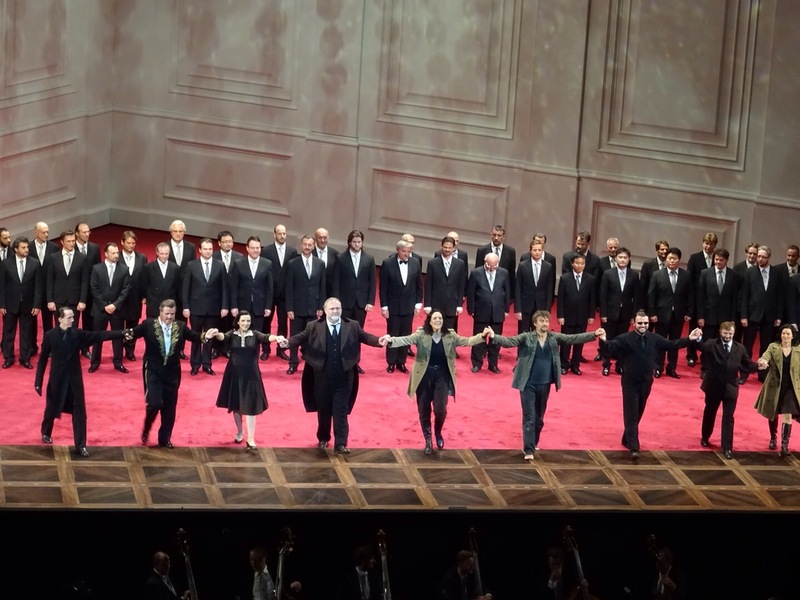 The audience provided thunderous applause to Wiener Philarmoniker and Franz Welser-Möst, that was even louder than praise to singers and chorus, which delivered great performance. In overall, the orchestra and cast did great job, while I had some confusion regards production concept and necessity of intense use of so many various symbols to indicate internal conflict, solitude, desolation and our personal neverending loneliness. The ending was sad and kind of hopeless.. Need to watch that DVD with Zurich production and reconsider which one speaks to me with Beethoven’s original intent. I found this a riveting production. Guth seemed to directly oppose Beethoven’s intent at almost every turn and especiallly at the end. Hope (life) vs Despair (death). The other core theme: the redemptive power of (conjugal) human love also failed at every turn. Leonore is alone. One of the most telling points in Guth’s oppositional approach was to place the singers of the final chorus off stage. Hope and redemption nowhere to be found? As I said, it was reiveting and ultimately very depressing. Best to listen to Beethoven’s 9th or another Fidelio production. I have not seen the Harnoncourt version from Zurich but I have it ordered on Blu-Ray. The Abbado/Kaufmann/Sitmme version on CD is wonderful and leaves the listener with HOPE intact.